The northern countryside was a place of a great beauty juxtaposed with a sense of lingering, imminent doom. Unending plains of unruly grasses stretched out in every direction, undoubtedly harboring some foul burrowers beneath their surfaces. Forests bloomed in the distance, dark and untouchable by the greedy, grabby hands of men. Mountains towered on the horizon, indistinguishable shapes fluttering and flapping as they soared about the peaks. The power of nature was evident - the strength of the unnatural creatures taking refuge in its warmth was yet to be determined. "Sir!" a sharp voice cut through the tranquility. "Sir, we'll be disembarking now. This is far enough." Robert Kurtz was a tall Imperial with a hard gaze and a face like the solid gray rock of a cliff side. He had recruited the members of his party in the tavern at Endibraut Hall, where they had heard the story of Sir Aliser Holt and his mysterious fate. With promises of treasure to find and monsters to kill - an adventure worth telling a tale about - it had not been difficult to find a sizable group of warriors to accompany him. The crew was a motley bunch. There was a good mix of Imperials and Northmen, as well as a couple of dwarves and a lone elf. A few were suspiciously dressed; some were clearly into thieving and others were suspected users of magic, but that mattered little in this country. Kurtz hardly seemed like the kind of man to go turning anybody into the Inquisition, at any rate. The man with the mask in particular was an odd one, but the locals whispered with such fear where he walked that he could be nothing if not useful to the expedition. In town, Kurtz had paid a handsome sum to a merchant traveling from Endibraut to the Dwaerrodowns to pick up a shipment of foodstuffs. The merchant's wagon was empty in anticipation of his goods, and so there was plenty of room for a small band of adventurers to load up their equipment and occasionally hop onto the back of the vehicle to rest their weary legs - for a price. Kurtz was more than happy to pay the merchant his fee and cover the expenses of his traveling companions. Now, at his command, the wagon rolled smoothly to a halt as the horses towing its load slowed to a trot. Kurtz was the first to jump off. As the others gathered their things from the wagon and stretched their legs, he went around the front to give the merchant the second half of his payment. He waited a minute while the last of the gear was secured, then stepped aside. "We are grateful for your services, sir." Kurtz bowed slightly. "Best of luck in your travels." The merchant nodded in return. "And to you as well." His gaze lingered in the distance, on the treacherous terrain off the road and across the plains. "From the look of things, you'll be in need of it." He gave his horses a sharp lashing that set them back into motion. The cart rocked noisily down the path, which snaked away and slithered between two foothills before disappearing over the horizon. Robert Kurtz turned to his party and rested one hand on the pommel of his longsword. "It will be several hours before we reach the edge of Blekmyr. I hope to make it halfway there by midday, at which point we may rest if our progress is sufficient." "I'm sure none of us are in the mood for complaining; I'd like not to hear it." He began to set out on foot, the rest of the party trailing after him, looking more like a herd of cattle than a row of ducklings following their mother. The ground ahead of them was uneven and without paths, with rocks and cliffs overlooking their progress on all sides. Further ahead the terrain leveled out, only to grow untamed with weeds and shrubs as solid soil gave way to puddles and pools. Here, just walking would be a task better suited to animals than men. It was only the maw of the wilderness. The belly of the beast was far ahead, submerged in shadow and swamp. "He hadn't killed Thor Krulak back in the Bjorning tribe. He had found him dying and was cradling him in his last moments when the village levy found him. They brought him before the village elder. Cradoc had assumed that it was a normal procedure, collecting information that would help detect the murderer. Instead, with a slight smirk, the village elder pronounced the sentence. "Cradoc Storm-hand, Keel of of Bjornburg and acolyte of Tyr. You are charged with murder of the Elder and Druid Thor Krulak, servant of Odin, and keeper of the pyre. You are also charged with worship of Crom Cruach, who is a blot in the face of the gods! YOU ARE HEREBY BANISHED FROM BJORNBURG!" The Elder brought his fist down upon the table, spilling black ink like blood across the ground. As the guards dragged Cradoc from the room, Cradoc caught a sight of the Elder one last time. The Elder had a subtle, devious smile, and a glint in his eye. Cradoc was still shocked by the sentence, as the guards brought out a branding iron with the seal of the "útlegð" or "banished". He barely felt the burn as the hot iron was impressed upon his neck. Tears streamed down his face as he realized that he would never see his family, house, home, or friends again..."
...Cradoc tripped over another rock, bringing his mind back to the present in an abrasive surprising way. He took moment and surveyed the rest of the group. 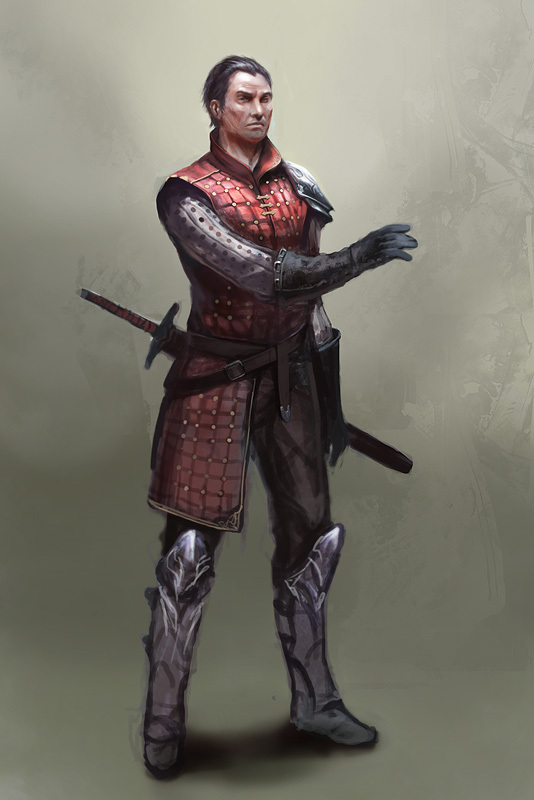 The Imperial who had hired him at the tavern was leading the party across the difficult terrain. There were several other North men, which was pleasing to Cradoc's eyes. Cradoc moved through the column until he was walking along side one of the North men ((Horatius)). "Good day, friend. From where do you hail?" Edited by Bobafettmaniac, 14 December 2012 - 02:13 AM. Kragnar was the second one off the wagon as they rolled to a halt. He landed hard on his feet, quickly straightening himself and drawing in a deep breath of Northern air, waiting for the merchant and Kurtz to finish speaking. He surveyed his traveling companions again, wondering what interesting stories these folk had to tell. Of course, he doubted any were as interesting as his, but some of them were incredibly strange. The man in the mask slightly unnerved him, and he wondered what his reason for being here was. After all, Kragnar came here to fight evil. Making coin and a name for himself was only something to be done on the side. He was not daunted by the thought of what mysteries and monsters lay ahead. He was all too confident they would taste his steel and the steel of his fellows. Then, Holt turned to look back at them. "It will be several hours before we reach the edge of Blekmyr. I hope to make it halfway there by midday, at which point we may rest if our progress is sufficient. I'm sure none of us are in the mood for complaining; I'd like not to hear it." Kragnar gave a hearty laugh. "Who's complainin', lad? 'Tis a fine day fer a walk!" As they began their journey, Kragnar returned his attention to his fellows. He shifted the straps of his void iron shield about while he thought, as if making sure it was still there, though the weight of it on his back could hardly be mistaken - even if it didn't bother him, being a dwarf. There was another dwarf here - a woman, no less - and even an elf. It had been a long time since he met any elves, and he was not unaware of the occasional bad blood between their races. But this was an idea Kragnar didn't share, so he figured it was best to try and put pointless rivalries aside as quickly as possible. Kragnar picked up the pace some to join the shadow elf woman, and he performed a slight bow as he strode alongside her. He was indeed a dwarf, a reveler, and a fighter, but he was also of noble birth, so he was by no means lacking in manners when he wanted them. Whenever anyone told him dwarves had no manners, he laughed loudly in their face - which somewhat proved their point, but that was currently irrelevant. After all, this was first acquaintances, and Kragnar didn't want to start off giving a bad impression. That would probably come about later, when he sang loudly around the campfire. "Good day, m'lady elf," said Kragnar, offering her a large smile that spread out his thick, red beard. "I be Kragnar Firebeard, warrior, runemaker, an' vanquisher o' evil. May I have the honor o' yer name?" Jaysen was glad they had the merchant to carry them alone, though he would never admit it. His legs were stiff from riding in cramped quarters, but he didn't complain. Instead, he slept in the back, and if anyone bothered to wake him up, he would slap their hands and fall immediately back asleep. He told himself the reason he could fall asleep so easily was that he learned the art from adventuring. He was lying to himself, he knew it, and just didn't want to admit that age was catching up to him. When they stopped, someone jerked him awake and this time he had to get off. He slugged his pack on his shoulders, and hopped off. They were a motley crew, that was for sure. Not exactly the type of people Jaysen wanted to deal with in on his last adventure (another thing he wasn't admitting to himself), but they would have to do. Why should his last trek be anything special? Or worthwhile? Or even enjoyable? He followed behind their leader, the rough terrain taking its toll on his feet far too quickly. He wouldn't let it show, or at least, he didn't think it showed, and as he stumbled over the rough ground, the pots and pans he had on his back clanged and clacked. He shook his head, as he got a few disapproving looks. "They'll thank me later when I cook something edible on our break," he said, mostly to himself. He didn't want to talk to these people. It had been some time ago when Helga Durnen had arrived at Endibraut Hall, and shortly thereafter been hired by Kurtz. As well as a ten others or so, if Helga hadn’t forgot how to count. It was a good-sized party for an adventure like this, and what made it better was not only the sight of a male of her species, but one that didn’t look crazed with a thirst for blood like the last one had. He also wasn’t as terrifyingly ugly (even by dwarf standards) as the berserker, with a well-kept beard and admittedly quite handsome features (again, dwarves). However, they were separated by a distance of several yards as they followed Robert away from where they had left the cart. During the ride there, Durnen had done her best to spend as much time sitting as she could, knowing that marching all day with all her equipment on would be trying even to someone of her admittedly thick stature. Now that they were here, marching through broken terrain that a mountain goat would find quite homely but the well-laden ex-Enforcer found most troublesome. After a minute or two of stumbling along (and muttering under her breath as she noticed the elf woman, a mage of some sort, gliding along like she were on an everyday stroll), Helga saw the other dwarf spark a conversation with the elf. At first surprised, then rather indignant, Durnen eventually decided there was little to it other than the dwarf deciding to get a mage on his side. Thinking about it a little further, the Enforcer also came to the conclusion that perhaps if there were no other dwarves around and a lack of human mages, she might approach an elf mage, too. Either way, she would over look the incident. For now. Not that that meant she was going to let some elf girl steal the first male of her race that she had seen in his right mind (more or less) without doing something about it. In a short series of noisy sprints to close the gap between them, Helga finally fell into step beside the other dwarf, out of breath from moving that quickly over such rough terrain with that much equipment on. The two had just shook hands as she approached, and Durnen nudged the other dwarf. After a short pause, she realized she forgot to introduce herself. Edited by Burger Warrior, 14 December 2012 - 04:24 AM. Lynaia was home. It had been many years since she had last been up North, and she had missed the climate, so different from that below the wall. She walked along, her staff occasionally clacking against stones, the wood cool in her bare hand. Her gauntlets, unneeded at the moment, hung from her wide copper belt. Though mostly lost in her own thoughts, she was not unaware of her fellow adventurers. The fact that she was the only elf bothered her not in the least, in the past 15 years she had spent far more time amongst men than her own kind. "Good day, m'lady elf. I be Kragnar Firebeard, warrior, runemaker, an' vanquisher o' evil. May I have the honor o' yer name?" She turned to see the red-bearded dwarf smiling broadly as he gave a slight bow. "Lynaia Argentis, Priestess of Selene," she replied with a slight smile of her own, bending slightly to shake hands with the dwarf. Arthur vaulted easily over the railing in the cart and set his feet on solid ground once more. Being a seaman, the rocking and bumping had reminded him of his time aboard the Cold Herring, a time not so cherished to him. Shaking off his weariness, Arthur set his gaze far to the north, up to the mountains. A thin layer of fog still enveloped the highest peaks, making them nearly impossible to see; it was a beautiful sight to someone who'd known only the vast flatness of the ocean for so long. He smiled and rested his hand on the hilt of his cutlass, letting his fingers trace the not so intricate designs etched onto the pommel. It was a fine weapon for fighting, but it lacked show of any sort. Robert was a fine man for allowing an old scalawag onto his noble quest, he thought to himself as he quickly surveyed the group. There were two Dwarves and a fair Ellf maiden with strikingly beautiful creatures. He had never seen an elf before this quest, and he doubted he'd ever see another one. On the other hand, he had known many Dwarf sea rats in his day, so the sight of the stocky creatures gave him little pause, though he had always assumed that the women grew beards much like the men. A queer look spread across his face, and he audibly shrugged as he hefted his small pack out of the cart and fell into step with the others. As they began to trek along, he couldn't help but notice the constant click-clacking of Jaysen's pots and pans. Smiling with amusement as he watched the man bob up and down with the lack of vigor that only a human who had seen too many winters could accomplish, he took him in. Taller than him, but not by much, and covered in scars, Jaysen was an intimidating sight. Still, something about him seemed... well, not exactly inviting, but indeed personable. Arthur could work with personable. Letting his pace slacken a bit, Arthur soon came beside the man who seemed not to want any kind of company. With a friendly, yet not overly so smile, Arthur extended his left hand, palm facing up to indicate that he wished to help. "Might I take some of those pots and pans, sir?" he asked politely, "Lessen your load, and probably the din of metal on metal at the same time?" He couldn't move. Not that he felt any need, to. He was lying perfectly comfortably in the bed, soft and warm, completely safe from danger that would be lurking outside. His face was dimly lit by a candle, bathed in a soft orange light, lulling him to the point where he simply could not stay awake by sheer force of will. With resignation, he put out the candle with a pinch of his fingers and the room was in near-total darkness, with only a dim blue light leaking in through the window to guide his eyes. But he did not go to sleep as expected. Instead, he was wide awake and choking with anxiety. He couldn't put his finger on why, but he simply could not go to sleep. There was something unholy in this room, permeating the entire room with it's evil presence. There was danger here, simply put. He tried to move once again, but found that he still could not move. His breath came ragged as his heart pounded in his chest. Then, the shadows started to gather in the corners of his eyes, forming into a vaguely human shape, nothing more than a dark cloak and skeletal hands, and the face...it was beyond rational description. Evil and malice, a simple, unreasoning contempt for all things good and living swirled in it's eyes, stagnating the air around it. It floated close to the paralyzed man, putting it's face close to his until t came within feet, and that vile process began. There was no sound, other than the muffled noises that Turbati tried to make as he panicked. As that white, cloudy stream traveled from his body into that thing's mouth, he felt not cold but tense, as every single muscle in his body seemed to clump together. It felt as though his body was about to tear itself apart from the inside, forever leaving him a limp body unable to perform even the most basic of actions. "...by midday, at which point we may rest if our progress is sufficient. I'm sure none of us are in the mood for complaining; I'd like not to hear it." Time to go, was it? With a loud yawn, Som strapped his gear into place and help offload the rest of the cargo. He traveled very lightly, carrying most of his belongings in several belt purses of varying size, secured tightly so as to prevent any noise being made. 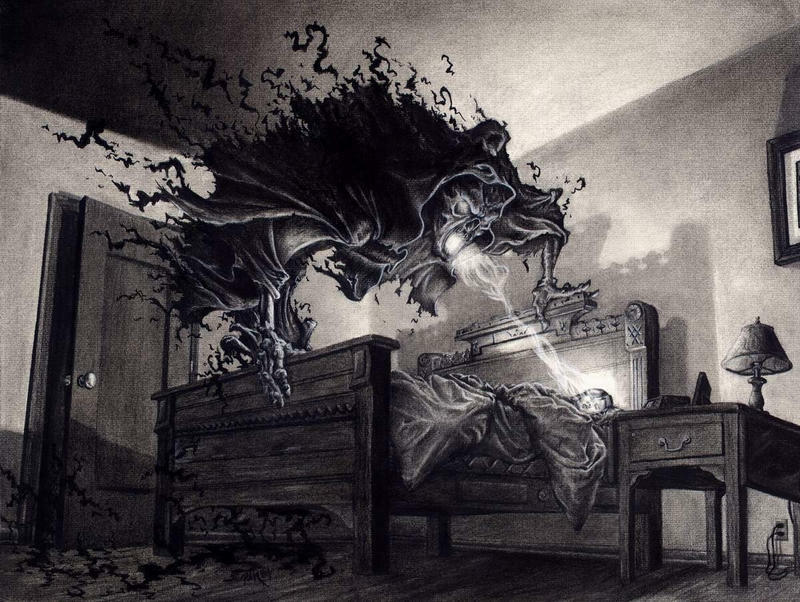 He ate light and used his warm cloak as a blanket, opting not to carry bed roll; he woke up several times a night, it wasn't like he had a good night's rest to worry about. Jaysen hated how much effort he had to put into walking. There was a time, it didn't feel so long ago now, that he could be running, (running!) through thick underbrush like this, barely having to look where he was going, just watching his feet and predicting the next spot to land, the momentum carrying him through. One mistake and he work crash to his knees, but that was the fun. The thrill. The sense of speed and adventure. Now, it was a conscious effort for him not to fall over on every rock they walked over. "Might I take some of those pots and pans, sir? Lessen your load, and probably the din of metal on metal at the same time?" Jaysen took another drink. Cheerful over here was being far too polite. Far, FAR too polite. And cheerful. And, Jaysen didn't want to hear it. He swallowed his drink, closed his flask, and tucked it back into his pocket, turning his one eye toward the newcomer. A fairly young lad, one who still had the eye for adventure. One who thought this stuff might be fun. "No boy," Jaysen said, his voice gruff from his dry throat (Alcohol only dried you out, after all). "These pans are part of who I am. They came with me on many adventures. Each dent has a story. And I ain't lettin' you get your grubby hands on'em." "No boy, these pans are part of who I am. They came with me on many adventures. Each dent has a story. And I ain't lettin' you get your grubby hands on'em." Arthur couldn't say he was all too surprised at the old man's reaction, and in all honesty just being polite like that was something he'd had to force. Living on a ship full of angry, dirty, nasty men and Dwarves was no picnic, and he'd had to adapt. He rolled his eyes and dropped his hand back to the hilt of his saber, resting it easily on the pommel. Arthur didn't want to start off with an enemy however, and so his next instinct to threaten the man was pushed aside in favor of a slightly less violent response. "Well at least wrap them in cloth before you wake every beast in the damned area, you old fool," he said with a sneer, "or have you entirely lost your sense in your old age?" "Lynaia Argentis, Priestess of Selene," she replied with a slight smile of her own, bending slightly to shake hands with the dwarf. The dwarf shook her hand graciously. "Pleasure meetin' ye." Kragnar gave a loud laugh, slapping his knee. "Much obliged, m'lady! I meant no offense, o'course." "Kragnar Firebeard," he said, still beaming. He was enjoying his companions so far. It was good they were getting along so well. And then he heard an argument brewing nearby, though he couldn't catch all the details over the clanging pots and pans carried by one of the human warriors. Two men were bickering, and Kragnar arched a thick brow. He had half a mind to go break it up, but hopefully they would get over their petty squabbles. If not now, perhaps they could forgive and forget over the light of a fire tonight. Kragnar was already looking forward to setting up camp - besides fighting, it was a highlight of the adventure. "'Tis a shame arguments like those start so damn early on ventures these days," said Kragnar, shaking his head in disappointment. Then he added jokingly, "Must be somethin' to do with Men, eh?" John hopped from rock to rock nimbly. He liked the outdoors. His bow was in his hand, and his quiver on his back. He was looking for someone to talk to. He'd balance himself on a rock, then walk through the group, spying to see anyone who was in need of a companion. The clanging fellow with the pots seemed the opposite. Reminded John of that old blacksmith, he did. Grumpy, that is. However, he saw a nice fellow trying to get silence the pots from clanging. He was bluntly refused. Then, the man tried a different approach. John saw no point; he could easily ignore the pots. John sprang of a rock and landed right next to the fellow, grinning like he always did. "Hello there! My name is John Sturdywood. Made that name up myself, actually." John paused, seeing as he was probably confusing the man. "I lived alone, you see, so I didn't have one to use. You seem a fair fellow! Join me on this momentous walk. No use with this grumpy fellow! By the way, what happens to be your name?" Then, already, arguments overcame the men of the group, with the subhumans(the elf and dwarves) making fun of all humanity as a result. Aos couldn't agree with them more. "Weak willed individuals gathered at a bar will do nothing but die at a moments notice," Aos said to no-one in particular. Aos traveled specifically to get a view of the world, to prove that the meaning of life is nothing more than to die. So far, judging by all the petty, scarred souls at the tavern, his judgement was right. But even he knew his judgement couldn't be based upon only that. Thus, he joined the quest. The druid cared not for riches nor adventure, but the opportunity to view the typical group of people. Already, the subhumans gathered together, and the Men began their fighting. This group was doomed. Edited by Surtur, 16 December 2012 - 12:57 AM. Karrel walked alongside the wagon in a posture both proud and cautious. He used his longaxe as a walking stick, clanking it into the earth with each step. The warrior absently wondered about his elven shortsword, as he so often did. Where did it come from? Who was responsible for that liberating attack on the orcs? Karrel noted an elf among their company, and made note to ask her about it. Instead, another northman strode up beside him. "Good day, friend. From where do you hail?" Karrel looked the man from head to toe before responding, aware that this was both impolite and a necessary precaution. Always best to know what sort of man you're dealing with before you reveal potentially dangerous information. The man's scars revealed him to be a survivor, and the ease with which he wore a sword signaled a fighter. Clearly a man to respect. Beyond that, Karrel did not know. "That is a question with too dark an answer for the first day's travels. You may call me Karrel of Braaswich." The northman drew the elven sword from its handcrafted fur sheath. It's silver steel glimmered in the light, marking the artistically designed grooves along the blade. A well-polished handle united wood and steel seamlessly, as only a master smith could forge. "Do you recognize this sword, or know who made such a weapon?" Arthur turned away from the old man, who was now busily sneering and clanging. The fresh face was a good change, and he could tell that the other members of the group were scoffing at him for fighting with Jaysen. Apparently he had chosen poorly when attempting to talk to him, but he didn't care what any of the others thought, most of all the creepy man in the cloak. "Sturdywood?" Arthur asked, still feeling a bit confrontational, but attempting to hide it behind humor, "compensating for something?" He immediately realized that he was trying to make friends, not alienate himself any further, and extended his hand. "Only kidding. My name's Arthur," he stopped himself before mentioning that he had been a pirate, "seaman and swashbuckler, at your service." Jaysen was insulted that Cheerful wanted him to wrap his pots and pans together in cloth. Not only would that dirty the pans, but it would certainly cause more trouble than it was worth. Jaysen had never, under any circumstances covered his pots and pans with anything, and he was not going to start now. He snorted through his nose as Cheerful met another, equally annoying cheerful fellow named Sturdywood. Jaysen, despite himself smirked. "Doubt that," he said under his breath. Jaysen figured that such a name was better suited to those who fancied the company of men like themselves rather than a woman, as any self-respecting member of the female race would sneer and shake her head at such a name. Jaysen would know. He met enough of them. Shrugging his pack higher over his shoulders, (CLANG CLANG CLANG now forgotten by the Cheerfuls, he turned around to the group. There was a strange man in a cloak (Surtur) who seemed to be, more or less, rebelling people away from his presence. Jaysen could see why, but he also saw with this newcomer an opportunity for some quiet. He let his steps slow a bit, so he was walking much closer to the cloaked man than any others. "Maybe I can get some quiet," he muttered, and turned his attention back to walking. His knees were really starting to ache. "My name is Cradoc Storm-hand. Judging from the distinct craftsmanship, and the stylish elements about the blade, I would have to guess that it is of elven construction. Am I correct?" Cradoc kept walking, producing a chaw of pipe weed. Tearing off a piece, he stuck it in his mouth, and chewed it as he walked. Drawing his father's sword, he handed the blade hilt-first to the other north man. "This was my fathers sword, which belonged to his father, who was given it by his father. I inherited it this summer, before... Well, before I left." Cradoc pushed painful memories to the back of his head, and spoke. "You can clearly see the contrast between the Nordic blade and the elven." Kragnar welcomed Helga warmly, but shortly after noticed a couple of the men arguing over one of the men’s pots and pans, which were making an awful din. ”I’ve always thought it’s due to their short life spans.” Durnen replied, watching as the two men separated, one to talk with a rather talkative fellow, and the other to hide in the sphere of silence around the odd-looking masked man, ”Just look at the older one that was arguin’. He couldn’t be much more than half a century old, and he’s already a sickly elder by human standards. I’m nearly at my first century, and there isn’t a touch of gray in these gold locks yet.” The dwarf woman emphasized her point by pushing a few unruly strands of blonde hair out of her face with an armored hand. Edited by Burger Warrior, 17 December 2012 - 06:08 AM. Despite bickering and small talk, stumbling and tough terrain, the party was making good time. The ground was only getting tougher to traverse as the soil broke apart and the holes were filled in with stagnant water. Reeds sprouted up from the pools, thickening as the marsh grew closer, concealing the puddles among weeds and shrubs. Walking was becoming a matter of watching one's feet, at the risk of stumbling into the muck. "Leave the old man and his pots alone," Kurtz said to Arthur Grafton, who walked beside John Sturdywood not more than ten feet away. "When we reach the forest we'll send him off on his own. Maybe he'll distract the wolves and trolls long enough for us to sneak by undetected." There was a bit of laughter from the dark-humored individuals, especially those who had found themselves fed up already with Jaysen Sanderson's racket. Over the sound of the laughter, it was incredibly difficult to hear the sound of Terin the thief falling into the water. He had been walking alone, behind the rest of the group, when he stepped into a pool by accident and disappeared beneath the water's surface. He struggled to find his footing so he could climb out, but the pool was deep and the water murky. Had he been a swimmer, it might have been an easy predicament to escape from. Luckily, the sounds of splashing water and thrashing limbs alerted the others, who soon realized someone was missing. Kurtz was the first to run his way, but soon found himself in the water, his foot caught in the mud of a shallower pool. "Someone get that boy and pull him out!" he ordered, tugging at his leg to no avail. "Curse this damn muck!" "My name is Cradoc Storm-hand. Judging from the distinct craftsmanship, and the stylish elements about the blade, I would have to guess that it is of elven construction. Am I correct? This was my fathers sword, which belonged to his father, who was given it by his father. I inherited it this summer, before... Well, before I left. You can clearly see the contrast between the Nordic blade and the elven." "Aye, Cradoc Storm-hand," replied Karrel. "You may think it odd to begin conversation this way, but the owner of this blade and I must meet. If ever you've heard of goblins using elf-swords, I..."
The sounds of thrashing in water interrupted the northman. Some fool of a boy fell into thick muck, and Kurtz himself was trapped by the ankle. Karrel extended his longaxe with the blade pointing towards his leader. He was careful to avoid the mud himself but offered his weapon to the knight. "Grab the axe, Sir!" he shouted. Sir Robert was his leader, and demanded his aid. The boy was not. "Cradoc, if you have a rope, that halfwit boy could use it. If not, help me with Kurtz."